Home > PRODUCTS > Toyota Supra MKIII REAR 12.19in 4 Piston FSLI Wilwood BBK withOUT parking brake. Rear 12.19in 4 Piston Big Brake Kit for the MKIII Supra without parking brake. 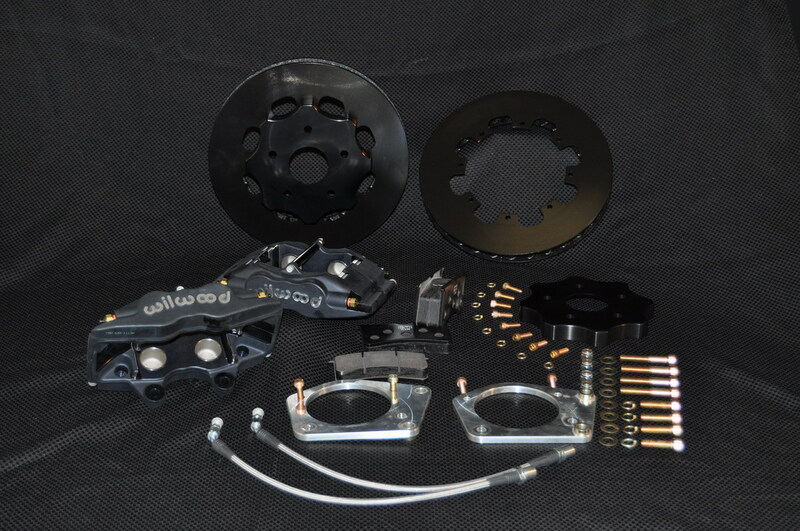 This is our MKIII Supra Rear 4 Piston 12.19 inch Wilwood brake kit without parking brake. -2 Wilwood, 12.19" dia, 1.25" thick, Spec 37 Rotors, (directional, curved vane) Black E-coated. (Wilwoods special Mil-Spec finish they do exclusively for Arizona Performance on all of our rotors). ROTORS: This kit is all about weight reduction, as we use an aluminum caliper bracket, and you remove the factory parking brake and backing plate. Also we employ the Ultra-Light UL-32 directional vane rotors provide an excellent balance of efficient cooling and lower rotating mass. UL rotors are cast from premium grade, long grain carbon iron for long wear, high thermal stability, and resistance to distortion. UL-32 rotors are production machined and well suited to a wide range of racing applications. As always we purchase these with Wilwood's premium Black E-coating to resist corrosion and maintain an excellent finish even under extreme use.